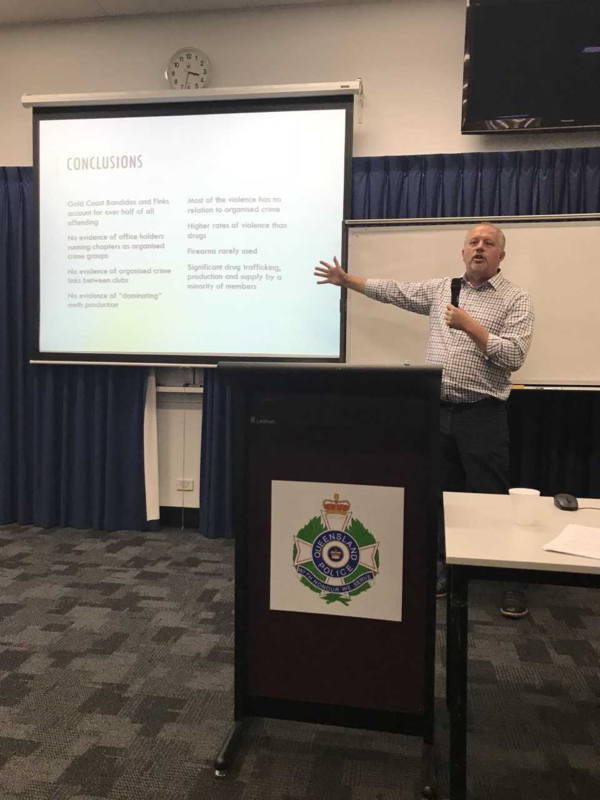 On the 8th March the Crime and Justice Research Centre was invite to deliver a Research Showcase at Queensland Police Service. The event, hosted by Frontline Research and information, Organisational Capability Command at QPS and facilitated by our QUT Police Fellow, Inspector Chris Emzin. 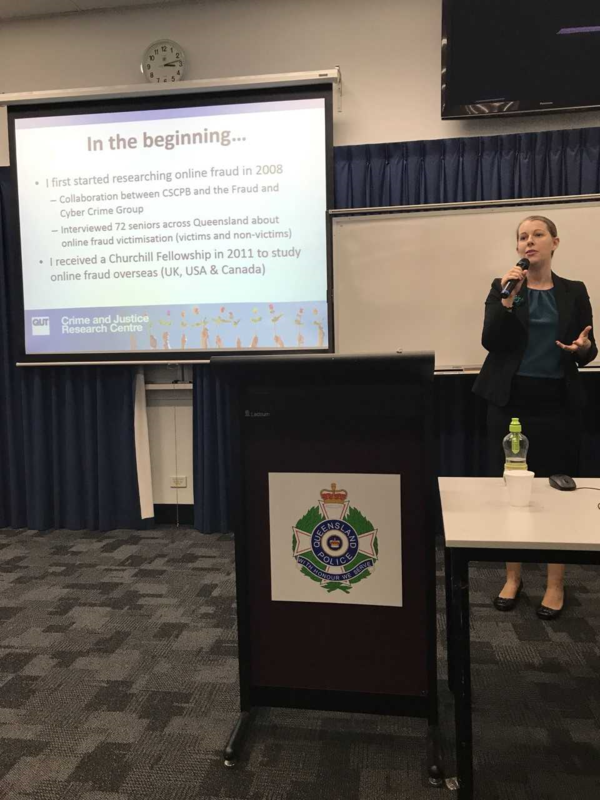 Four CJRC members: Professor Kerry Carrington, Dr Cassandra Cross, Dr Claire Ferguson and Associate Professor Mark Lauchs presented their work to the QPS cohort, to highlight and share work conducted at QUT. 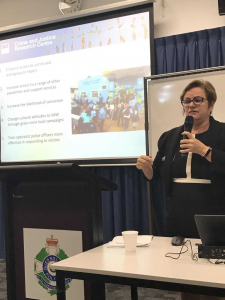 Professor Carrington discussed the policing of gendered violence in the Global South, focusing on the innovative approach of women’s only police stations in Latin America and possible applications in the Australian context. Her ARC Discovery project with Professor Maximo Sozzo will explore the prevention of gendered violence; lessons from the Global South. Dr Cross reflected on her work with online fraud which she began while working for the Queensland Police Service, and her Churchill Fellowship which extends this work and the challenges police and victims face when responding to fraud. She also outlined her current projects and future research directions in the field of cybercrime, digital crime, fraud and romance fraud. Dr Ferguson spoke on her fascinating research and consultancy in the field of forensic criminology, offender evidence manipulation at homicide scenes, how police can combat these efforts and processes of determining death in complex cases. 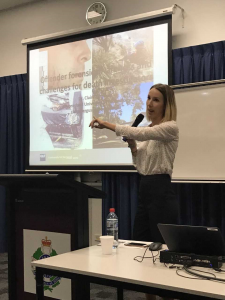 She outlined her research in Australian jurisdictions and beyond, on strategies offenders use and features police can use to combat these efforts. Associate Professor Mark Lauchs’s presentation covered his work on organised crime and outlaw motorcycle groups. He summarised strategies researching these fields in Australia, with limited data in the public domain; how to redress knowledge gaps and explore the ‘organised’ component of crime as well as impacts on the community. Thank you to the team and to Chris for facilitating what was, we hope, the first of a series of research events with Queensland Police. We look forward to exploring future research collaborations and initiatives with QPS.